Colorful book covers protect your labels. Fully adhesive removable labels are ideal for everyday use on folders, documents, books and more. Easy to take with you in a pocket, purse and bag or leave them on your desk for labels at your fingertips. Non-stick tab makes it easy to peel, apply and remove. Write, Peel and Stick™. 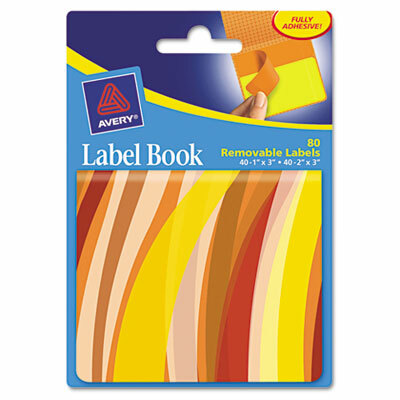 Get organized in style with Avery label books. Colorful book covers protect your labels. Fully adhesive removable labels are ideal for everyday use on folders, documents, books and more. Easy to take with you in a pocket, purse and bag or leave them on your desk for labels at your fingertips. Non-stick tab makes it easy to peel, apply and remove.